Looking for something different for dinner tonight? 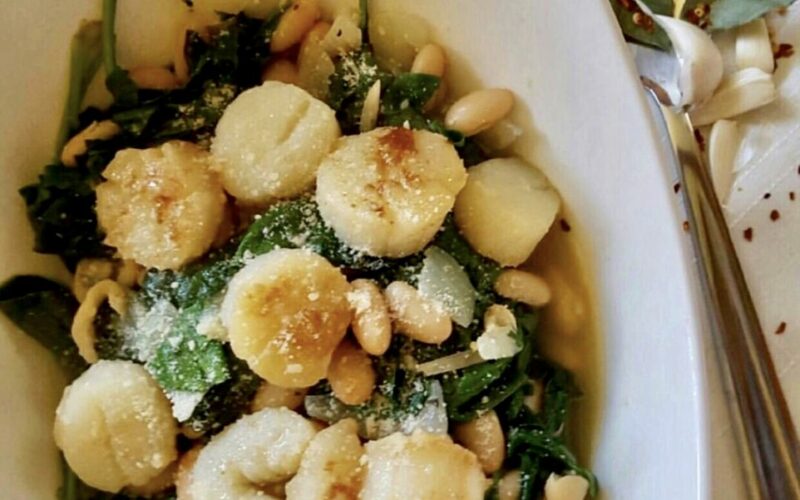 How about seared scallops with beans and spinach? This dish combines three highly nutritious foods into one meal, and it is absolutely delicious! I love seafood, but I don’t prepare it very often at home. I have my kids to blame for that. I have one that would eat shrimp, scallops and crab very night of the week, one that won’t touch it, and another that could take it or leave it. And, I know I’m not alone on this one. Fish can be a tough sell for kids. If you’re attempting to incorporate more seafood into your meal rotation, and you want your kids to actually eat it, I suggest starting with mild options. Scallops is one option. Scallops are a great source of lean protein, but also contribute two nutrients most of us need more of in our diet – potassium and magnesium. The scallops are combined with two other highly nutritious foods –beans and spinach, as well as a variety of other ingredients. The result is a highly nutritious, delicious meal filled with to flavor and phytonutrients. One important consideration when making this meal – it’s higher in sodium than most meals I make. I used canned beans to save time, but if you are watching your sodium intake, you can buy dry beans and soak them overnight. You can also use low-sodium broth in place of regular. Enjoy this delicious balance of carbohydrates, protein, healthy fats, vitamins, minerals and phytonutrients all wrapped into one meal! 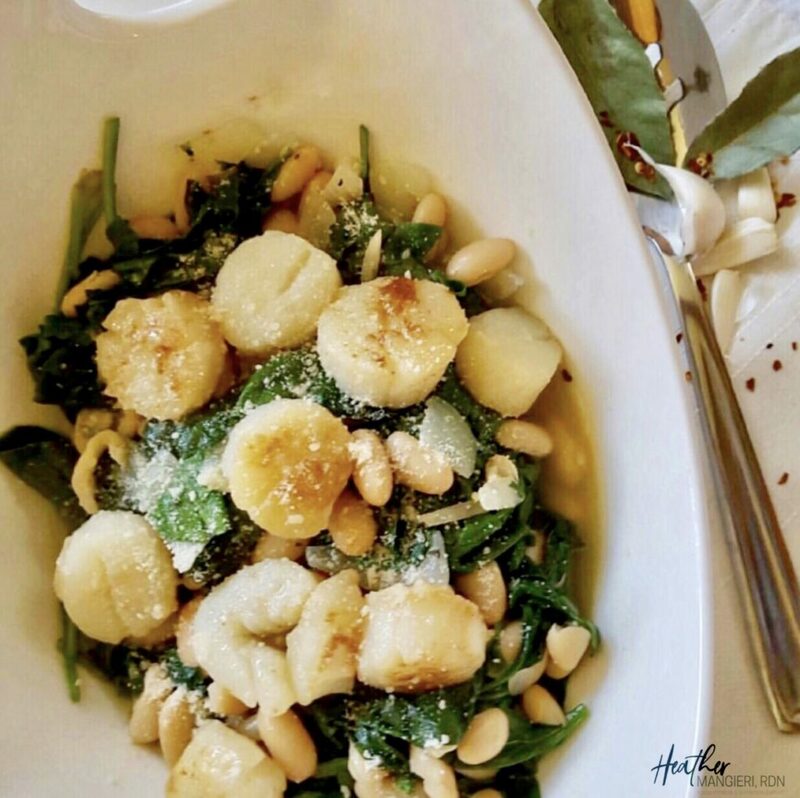 This seared scallops with beans and spinach dish combines three highly nutritious foods into one meal, is easy to prepare, and it is absolutely delicious! Nutrition Facts per serving= 260 calories, 26 grams’ carbohydrates, 23 grams’ protein, 6 grams’ fat, 30 mg cholesterol, 7 grams’ fiber, 1,030 mg sodium, 150 mg calcium, 700 mg potassium, 4 mg iron.